Has it been this long since I was on the radio?? My last blog post was over a month ago! What's the reason for this over due lapse........I have really not been on the radio or for that mater doing any thing radio what so ever. I have not fallen off the Ham radio wagon but have been busy with my other budding hobby... photography. My wife Julie is into photography big time has taken me under her wing. I have using my time to learn the in's and outs of our camera's (Nikon D800, D810 and a Lumix mirrorless) along with editing software such as Adobe Lightroom. I'm begging to understand that "point and shoot" is the past and for me understanding the camera and the shot is my new learning curve. As you can see from the above picture ( Done with my iPhone and an instant fail in my dear wife's eyes) the roll top desk was long overdue in opening. Today it was time to get down to some radio time. I setup the MFJ 1788 loop antenna on the balcony and flipped the K3 switch. I found myself on 20m and the band was in decent shape. I came across F6HKA calling CQ and I called him and he came back to me (with a few repeats of my call) we had a nice QSO with the standard exchange. My mode of choice was CW, my report was 229 and he was 559. The code speed was about 15 WPM and I must say even with the time away from the radio I found this speed very comfortable. Before I knew it was time for Bert to move on as he had others waiting to make contact. I was thrilled to had made this contact and I soon after sent him an email of thanks. It's not news that the solar cycle is in the down swing BUT I read some very encouraging blog posts over this past month...On March 7th John N8ZYA posted that he had contacted Australia VK3CWB with 5 watts and using an indoor antenna!!! 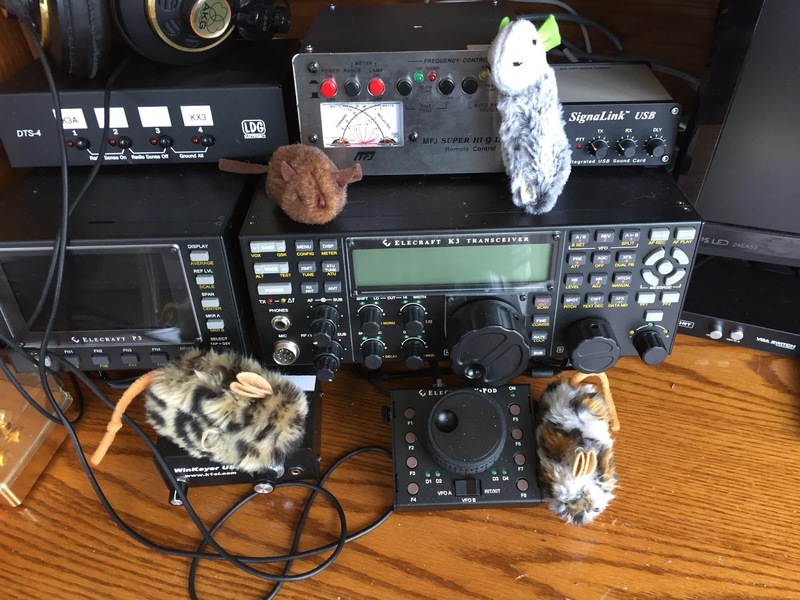 "Its not the QRP which is important, it's the enthusiasm, endeavor, application and belief that things can be done simply which I really admire. And of course, if you run QRP there must be a persistence and a "never say die' attitude which is also most admirable".